There are more than a few ways to find the projects in the Builders Exchange of Kentucky IPIN system. One of the best methods, filters, has already been covered here (spec and CSI code) and here (SAM search). Another tool can be found at the My Deskpad area, above the calendar. There are four reports located there: My New Prebid Projects, My New Active Projects, My New Apparent Lows, and My New Contract Awards. These four reports can generate a list of projects that have been added to the IPIN system within each phase since a previous date entered by you, our member. 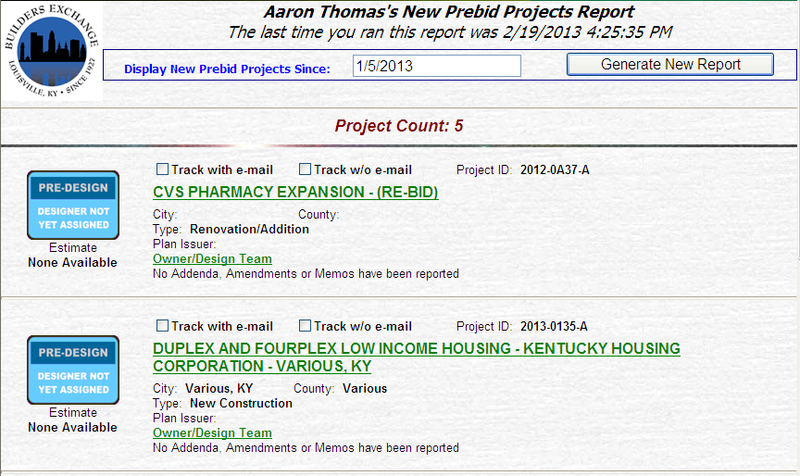 Click on the “My New Prebid Projects” link on My Deskpad to access the report. If you previously ran the report, it will show the last date and time directly above the date field. In the above example, the last time I ran the report was January 25, 2013. Next, enter a date in the field. After generating the list you can scroll through each project, access the project details page, or track the project from this results list. 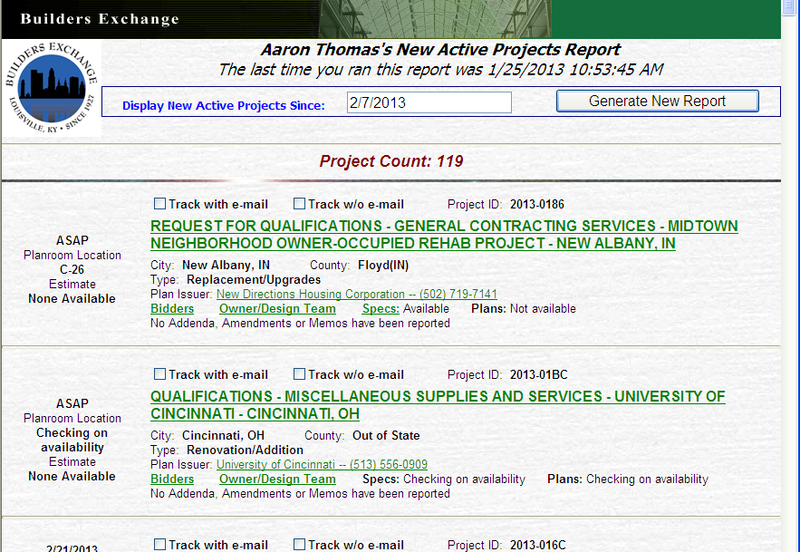 Click on My New Active Projects to access the report. As was demonstrated with the prebid report, you will be shown the last time the report was ran. Enter any date in the field to generate a list of actively bidding projects that have been added to the IPIN system since the entered date. It should be noted that this list does not correspond to the settings in your filter. This is only a list of every single project added to the system since the date entered, regardless of project type, category, or location. Many members use this report on a daily basis to look at any new projects that have been added to the IPIN system since the last time they logged in. It is also useful for quickly catching up on any new additions to the plan room after a few missed days due to vacation or time off. This report functions the same as the other reports with one major difference: the ability to limit your report to the apparent lows reported for only the projects you have been tracking (for more on tracking projects, click here). 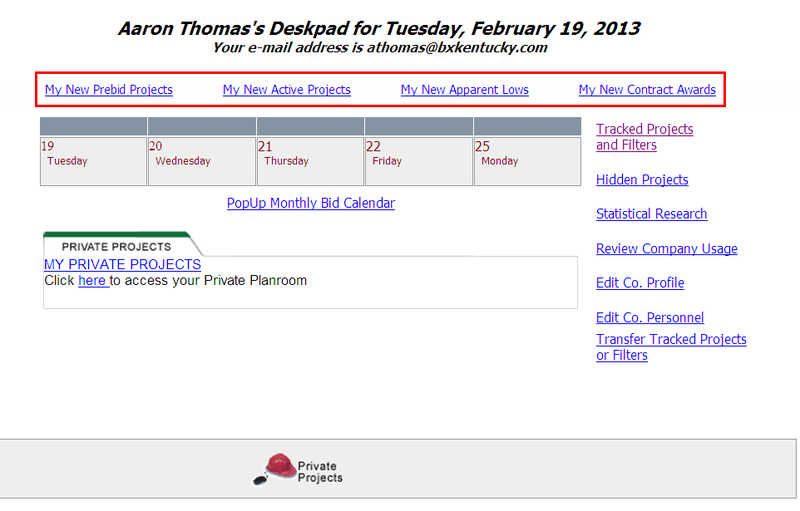 You can generate a report of every project in the system that has had an apparent low reported since the date entered, or you can choose the “Only My Tracked Projects” option to generate a list of apparent low bids reported for your tracked projects during the same time span. You can use this report to quickly check the apparent low reports added to the system, or to very quickly check to see if any apparent low bids have been added specifically to the projects you are tracking. This report functions in the same way as the apparent low report above. You can generate a report of every project in the system that has had a contract award reported since the date entered, or you can choose the “Only My Tracked Projects” option to generate a list of contract awards reported for your tracked projects during the same time span. Utilizing each of these reports will help you stay on top all the additions, changes and updates to new and recently bidding projects in the IPIN system. In combination with filters and tracking project you’ll keep tabs on all of the projects in the IPIN system!